The first Asteroid Terrestrial-impact Last Alert System telescope, or ATLAS 1, has been completed atop Maui's Haleakala volcano in Hawaii. The ATLAS telescope is one of two planned to search for potentially dangerous asteroids that might pose a threat to Earth. The first Asteroid Terrestrial-impact Last Alert System telescope is now in operation on Haleakala – on the Hawaiian island of Maui. 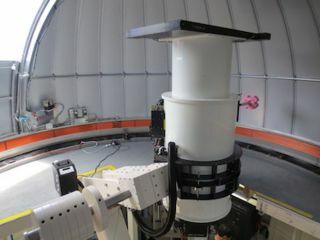 Known as ATLAS, the telescope is part of an asteroid impact early-warning system being developed by the University of Hawaii and funded by NASA. Once completed in 2015, ATLAS will consist of two telescopes 100 miles (62 kilometers) apart that will automatically scan the whole sky several times every night looking for moving objects. The mount for the Haleakala observatory is lifted into the dome. The telescope is located on Maui's Haleakala volcano and "is working well and producing useful images," according to a post on the ATLAS website. "We anticipate full resolution after some adjustments are made to the Schmidt corrector. The mount also performs well though it will require some fine-tuning to achieve ATLAS' stringent tracking specifications." "All aspects of this whole system are very much under development right now. However, the existing system on Haleakala can survey the entire sky in a little more than one night, and we have begun accumulating images," ATLAS representatives added in a July 30 update. ATLAS#1 telescope gently lowered into Haleakala observatory. ATLAS Telescope #2 is to be situated on Mauna Loa, a volcano located on the main island of Hawaii. This month, the ATLAS team was expected to meet with representatives from NASA and South Africa during the International Astronomical Union meeting in Honolulu. Discussions are to focus on the possibility of a third ATLAS unit in South Africa. Leonard David has been reporting on the space industry for more than five decades. He is former director of research for the National Commission on Space and is co-author of Buzz Aldrin's 2013 book "Mission to Mars – My Vision for Space Exploration," published by National Geographic, with a new updated paperback released in May 2015. @Spacedotcom, Facebook and Google+. Story published on Space.com.